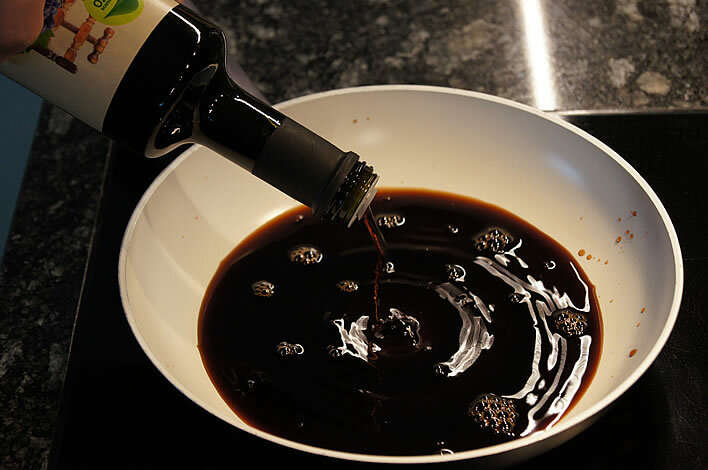 At the end of our recent piece on aceto balsamico we put forward a suggestion for the production of an inexpensive DIY version. Does it work? Let's see. It was in the shop that I happened to be in. 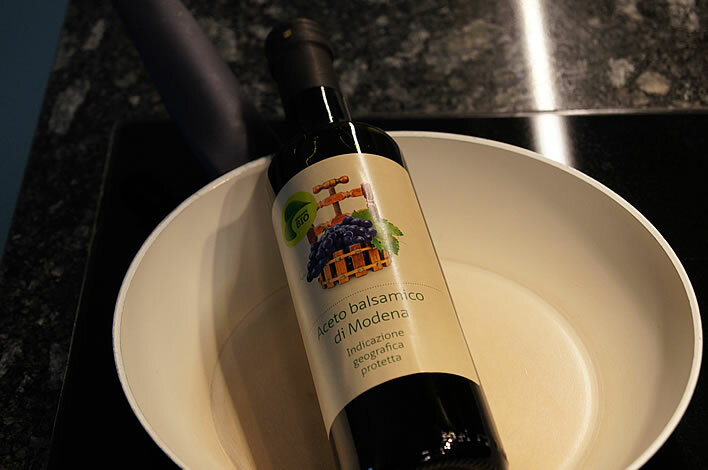 The origin of the contents was certified to be Modena. The price had been reduced from 5.80 CHF to 4.64 CHF. Volume 500 ml, made from organic wine vinegar and boiled organic grape juice. Its total acidity is 6%. Unlike all the other cheap and not so cheap balsamicos on the shelf it did not contain sulfites, which presumably would have been reduced and concentrated along with the vinegar. No thank you – my body is a temple. Nice label. No medallions. No crowns or other bling. The photographic department insisted that I use a broad pan with a white interior. 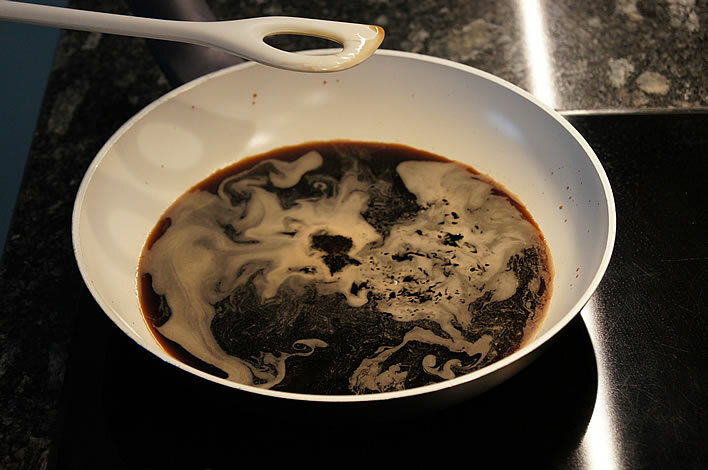 I have no idea whether this is better or worse than the narrow pan I associate with sauce making. …then brought it to a rolling boil and kept that going until it had reduced to a pleasantly viscous consistency. That took 18 minutes. 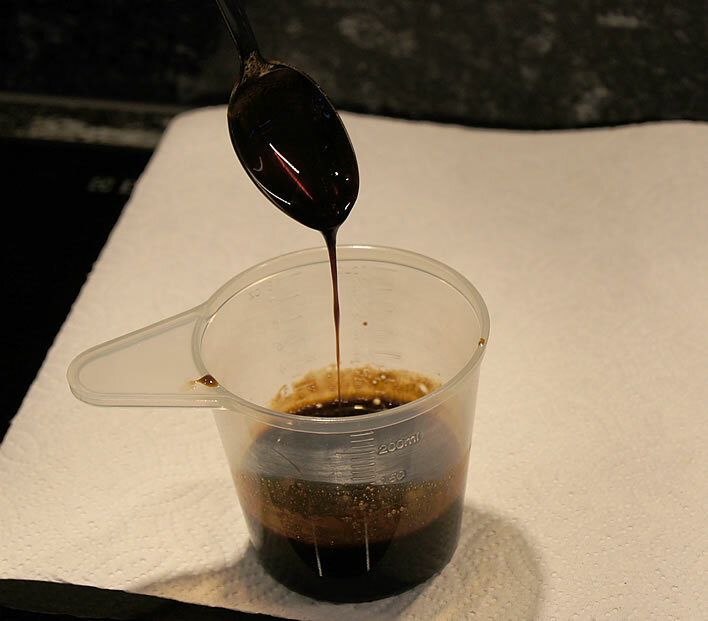 I ended up with just over 50 ml of DIY balsamico, that is, a reduction to one fifth of the original volume. 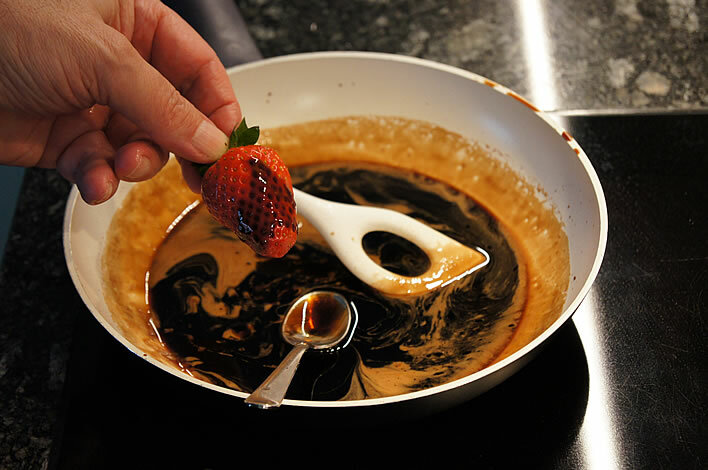 It was a relief that when the DIY balsamico cooled it did not turn into toffee. However, that said, the consistency was slightly too thick. 15 minutes or even 12 minutes instead of 18 minutes would probably have been better. 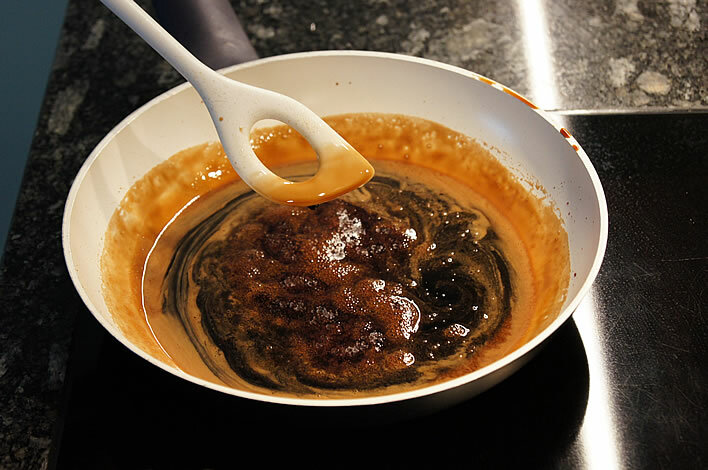 It's difficult to judge in the pan: hot syrup, cold toffee. The taste was pleasantly intense. It certainly brightened up the rather bland early-season strawberries from Spain, but on the whole it was too sweet for my preference. This surprised me since there is no added sugar in the original. The angels will have to work harder next time. 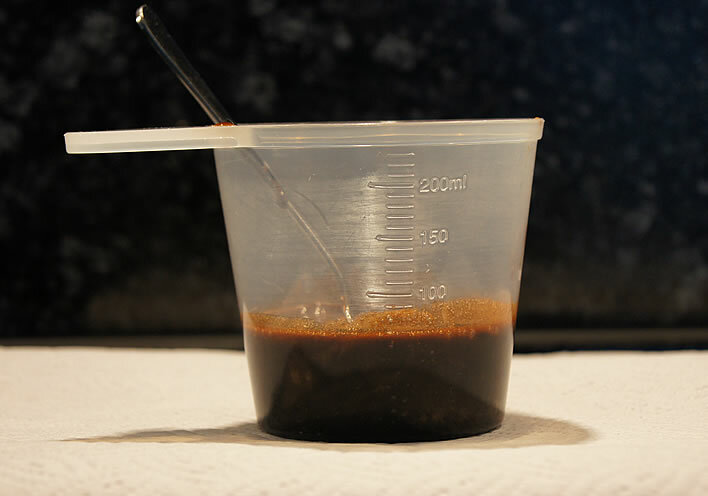 The high sugar content might also be the cause of the rapid descent into a toffee-like state. 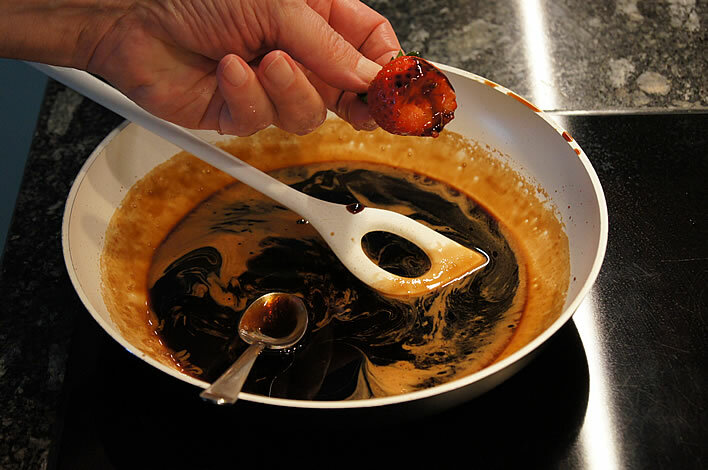 In order to loosen up the consistency I added a little of the original vinegar, which also added some sharpness to offset the sweetness. Whether one should do this anyway – well, you be the judge. 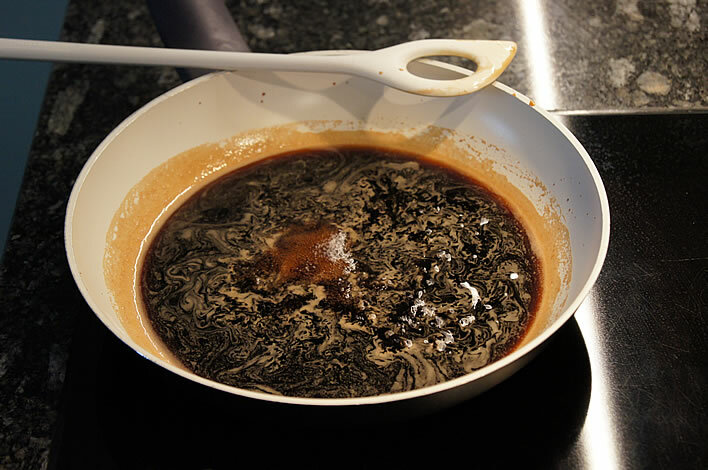 I can imagine that simply adding some boiled water might be enough to rescue the consistency. 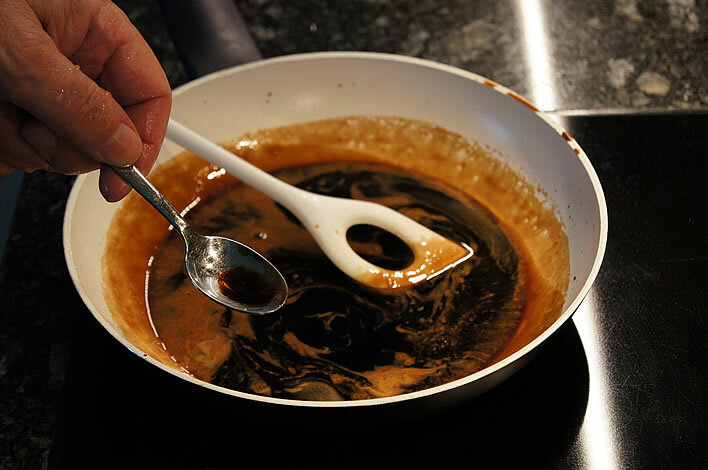 All in all an interesting and inexpensive condiment to have in your kitchen, requiring altogether about 20 minutes of relaxed preparation time and costing with cooking under 3 CHF, which is as near as makes no difference a similar amount in US dollars or Euros.